Oh my Quinny Bear… Homegirl is quickly learning what I mean when I say “Clean up!” and fast. I am not kidding when I say that when you are consistent with these ‘Get your kids to listen’ tips, they work. We were coloring and my 1 yo decided to do a little ‘cause and effect’ play by seeing what happened when she ‘made it rain’ with all the crayons. Instead of freaking out about the mess, I just kept coloring because my Princess Poppy from Trolls was looking fresh. I mean, my pink shades were spot on and guess what, I knew as soon as I told Quinn she had to clean up all 572 crayon that she just threw on the ground, she was going to listen. Once she was done with her exploration of cause and effect, I started to sing our clean up song and she quickly got to work. 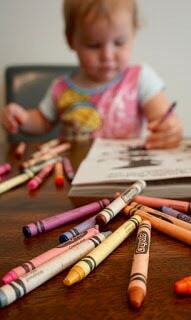 We then made it a game and she quickly started gathering the crayons. Once I see that she is trying, I usually start helping while also providing verbal praise by cheering her on (which also helps motivate her to continue gathering the other 451 crayons, lol). It is also fun to see her pride after she completes the task! Share your #BeeHavenTribeTips success stories below… I want to hear how you’re doing :). Next PostNext 7 Activities to Promote Listening Skills!